About a week ago, I saw a thread pop up on BGG from a user asking for feedback on his Kickstarter campaign page. After getting feedback from BGG and making some changes to his campaign page, the campaign launched on Kickstarter and it funded on the first 24 hours. That user is Nicholas Yu, designer of Hero Brigade. I reached out to him to talk about Hero Brigade, the Kickstarter campaign, and the changes he made to the campaign page. 1) Please tell our readers a little about yourself. I’m 35 and happily married, living in upstate New York. I decided to make a break from corporate America after spending the last 10 years there and pursue my love of games and game design. 2) Can you describe Hero Brigade in a few sentences? It’s a fast-paced card game that alternates between phases of deck-building and positional card-battling. You win by either defeating the opponent’s party of characters or depleting their deck, which is accomplished by defeating individual opponents. You lose a card permanently each time you reshuffle as well, so there’s always a set clock running down on both players! It pits a team of Heroes against a team of Villains in an epic showdown! 3) What is your favorite mechanic in the game? Each character card can be played in 3 different ways. The player’s party has a front row and a support row, and characters can do different things in those rows (sometimes vastly different). In addition to what they can do on the board, they can also be discarded for a one-time play effect. 4) Tell us how you came up with the theme for Hero Brigade. The ComiXology app has allowed me to re-embrace my childhood love for comic books and heroic adventure. I guess I had heroes and villains on my mind when brainstorming ideas. One of my friends and I also half-completed an iOS tactical RPG that had a similar theme, so I ended up re-using a lot of those concepts. 5) What’s your favorite Island? Taiwan. My Mom is from Taiwan and I actually spent a year there growing up when I was a wee tyke. 6) What are some other games that if other players liked that game, that they would like Hero Brigade? People who are into deck-building games like Ascension or Dominion should like that aspect of the game, but one thing that frustrates me about most deck-builders is the lack of player interaction. That’s why I built a battle system into the game, so it would force direct interaction between the players. Combat draws inspiration from Magic: The Gathering and Vampire: The Eternal Struggle. Play also constantly passes back-and-forth, both during the Fight Phase and Play Phase, so there’s a lot of see-sawing, which I think makes the game more exciting. 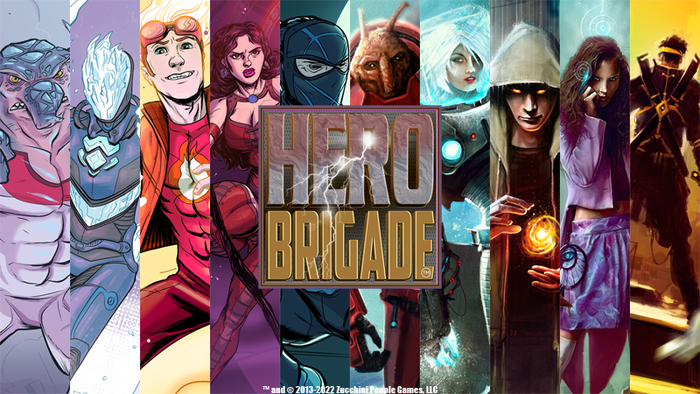 7) Hero Brigade is your first kickstarter board game project and it’s already funded. What are some of the things you’ve learned from this already successful campaign that you think other Kickstarter creaters would benefit from? Start early: I made the Kickstarter page in early February, got approved mid-month, but didn’t launch until late April. Do your research: Make sure you get detailed quotes for all of your costs, track your expenses, and build in some fudge room in your budget for unexpected expenses. Warehousing and shipping, in particular, can be an issue for a smaller team or individual. It turns out, coming up with an awesome idea and making a really fun game is only one-third of the battle. The next two steps are marketing and fulfillment, both of which are things with which I didn’t have much experience. Fortunately, Game Salute picked up Hero Brigade, so I don’t have to worry about the warehousing or shipping part of the fulfillment phase. 8) Before the campaign went live, you posted a thread on BGG asking for feedback on your Kickstarter page. How’d that go and what changes were made to your original page? That went extraordinarily well. The KS campaign page went through a few major steps of evolution: 1. After I originally drafted it up, I showed it to a few friends and made some changes based on their feedback. Rinse and repeat here a couple of times; 2. I showed it to some fellow game designers in The GameCrafter community and made some changes based on their feedback; 3. I posted that thread on BGG and got a killer amount of constructive feedback; and 4. I got picked up by Game Salute 4 days before the KS launch, so I scrambled and made a few more revisions before going live. Most of the major changes came in the last two steps. From the BGG feedback, I ended up completely redoing the pledge levels and stretch goals and re-writing two sections of the campaign. I originally had stretch goals like T-shirts and pins but everyone quickly pointed out how they’d much rather have additional game content added in instead. People also widely panned the intro video. I didn’t have the time or the right equipment to re-film, so I just cut out a minute in the middle where I started to ramble a little bit; but even that one edit ending up making a huge difference. 9) What were your design inspirations for creating Hero Brigade? Obviously, I drew a lot of inspiration from comic books and some characters in the game are a hodge-podge of homages to various characters I love or characters who have become archetypal of the hero genre. My love for Final Fantasy 6 also blossomed into the row mechanic that’s part of the battle system. I also really really love deck-building games, but I was frustrated by the lack of direct interaction as discussed earlier. 10) What type of gaming experience do you hope to create for the players of Hero Brigade? I really did my best to balance strategy and fun. I wanted to make a deep and tactical system without making it overly complex. I also hope to win over people who may not be the biggest comic book fans, either, but I feel comic books are becoming more and more mainstream, especially given the success of several recent films like The Avengers and The Dark Knight Batman franchise. 11) Anything else you would like to mention? I love my wife! I’m grateful for the support of my friends and family. I hope everyone checks out the KS campaign page for Hero Brigade and supports it! Thanks Nicholas for the interview! Make sure to check out Hero Brigade on Kickstarter now. This entry was posted in Game Design, Kickstarter on April 25, 2013 by Michael N.. Thanks for the interview, Michael, these were excellent questios! Also, good luck with your upcoming campaign for Monster Zoo! Let me know if you have any questions of your own when it comes time! Thanks Nick – really appreciate you taking the time from managing the Kickstarter time to do the interview. I learned a ton and hope everyone else did too.